About 306 BBQ & Back Alley Sports Bar in Florence, Alabama - Barbecue the 306 Way! 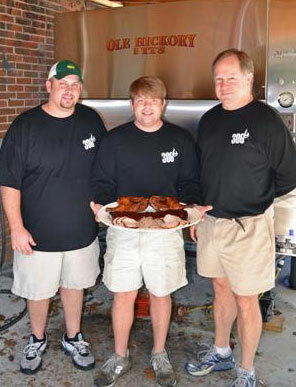 The 306 Barbeque journey began in a driveway on the eastern side of Athens, Alabama. When Justin Burgreen, Lee Noah and Whitney Skipworth started cooking meats on a portable smoker for friends and family to enjoy during ballgames and special occasions, they had no idea how far their weekend hobby would evolve. As word spread, the customer base grew and the guys found themselves providing full-service catering for local events. The buzz continued to grow as more people tasted - and loved - the food. With encouragement from their fans, Justin, Lee and Whitney began to realize the potential their venture could have and considered taking the next steps to bring their food to the masses. When a great restaurant location became available, the other pieces fell into place. They hired an experienced staff, purchased a larger smoker, commercial restaurant equipment and supplies, and prepared to open their new restaurant. Today, 306 barbeque is a full-service restaurant featuring fresh meat and delicious side items cooked daily on-site. The popularity of 306 continues to grow as word spreads about the three guys with a smoker who dish out some fine, southern food. They've come a long way from the driveway at 306 North Lindsay Lane. Justin, Lee, Whitney and their staff are excited to share their story and their wonderful food. Once you experience 306, you'll be ready to help spread the word. "Every time I eat at 306 BBQ I leave telling my husband that we should eat there more often! So good! I've had their bbq, ribs, and chicken as well as most of their sides! All of it is good!"